Having discussed in this week’s Monday Musings Margaret Merrilees’ essay on white authors writing about indigenous Australians, I’m now getting to my promised review of her debut novel, The first week, in which she does just this. It also, according to Wakefield Press’s media release, won the Adelaide Festival’s Unpublished Manuscript Award in 2012. I can see why it did. … it was different now. There was a claim on it. This fence, a fence she’s ignored for years, had taken on new meaning. Where she stood was her land. The other side was theirs. Someone’s. Those Noongars from town. What would they do with it? Any more clearing would be a disaster. The salt was already bad down there. This comes early on day one, Monday, before she hears the news about Charlie, but already Merrilees has introduced us to Marian, the land she works and her attitudes. She clearly has little respect for “those Noongars from town” and yet she knows the land has been damaged. Merrilees also describes other aspects of Margaret’s life that will help inform our understanding of the week to come – guns, the family’s dynamics including her relationship with her troubled late husband, a dependence on a more savvy friend. It’s all lightly, naturally done through a well controlled third person voice. By day two, Tuesday, Marian is in Perth, where the first order of the day is to attend Charlie’s arraignment in court. Here she meets Charlie’s housemates and is invited to their home to talk about what has happened – and there she meets Charlie’s neighbour and friend, the indigenous woman, Lee. In addition to the reference to “those Noongars” on Monday, Merrilees leads us up to this meeting with other suggestions of Marian’s prejudiced attitudes to “other” (to Asians and Aboriginal Australians). Needless to say, her meeting with the educated, political Lee does not go well. Then you owe me … I won’t forget. Salvation doesn’t come cheap. 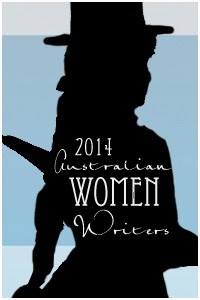 To my white Australian mind, Merrilees handles her indigenous characters well. They ring true to what my experience and reading tell me, but, as Merrilees also says in her essay, “it is not for a white writer or critic to decide what is appropriate.” I would love to know what indigenous readers think. Getting out of the car and leaving it behind suddenly seemed difficult. Her last tie with home and normal. If my review has seemed a little vague about detail, that’s partly because the book is too. There’s a lot we aren’t told about what exactly happened, about why Charlie did what he did, but that’s because he is not the book’s main subject. Early in my reading, I was reminded of Lionel Shriver’s We need to talk about Kevin. This, though, is a different book. Yes, both books are about a mother and a terrible act by a son, but Merilees’ compass is broader. It’s both personal and political. And so, on the personal level, Marian realises that she can – she will – survive. But it’s the political lesson that is dearest, I think, to Merrilees’ heart, and it is simply this, “that she, Marian, was ready to listen” to Lee’s story, to listen to it “wherever and in whatever way” suits Lee. 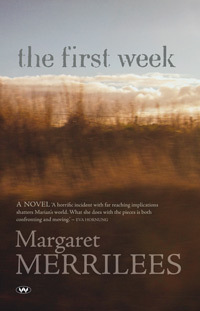 The first week is a compelling read with, dare I say it, an important message. I hope it gets out there. Lisa (ANZLitLovers) also recommends this debut. I am going to tell my mum to read your blog Sue. She loves to read too, and I think she could get some new ideas for books to read next! Oh thanks Cy. I like books that are open-ended too. I know you’re busy but reading fiction might be perfect relaxation. If your Mum comes here, tell her to say hi. Sounds marvelous! I like what you say about how she lets the characters be themselves, warts and all. It seems like even though the book has a message it isn’t something that is forced into the story but develops out of it. That’s good writing and good storytelling. Yes, that’s it Stefanie the message comes out of the story … We are with Margaret as she feels her way. You’re beginning to get the hang of this reviewing thing, aincha? [grin] Don’t know that I’ve come across another reviewer who manages to tell me about a book but not tell me too much about it. Thanks, Sue! Oh good MR … I sometimes worry that I don’t tell enough … You’ve reassured me! Sounds courageous and clear-sighted. Wouldn’t mind reading this at all! I reckon you’d find it interesting Catherine. I think it is a courageous thing to write. She’s clearly thought very carefully about it.